← What About Our Stuff? Personally, I consider mathematics to be a rather useful albeit, dry, intimidating field of study. In public school, my grades in arithmetic and math were terrible. I finally found a truce with the subject in college when I aced Algebra 101. A few years ago, I started an independent study of Trigonometry that more or less, still continues. To me, mathematics is difficult and requires a great deal of discipline for a follow-through. That is why I was surprised to find an attractively packaged slim volume about mathematics on the new books shelf at the Norfolk (Nebraska) Public Library. 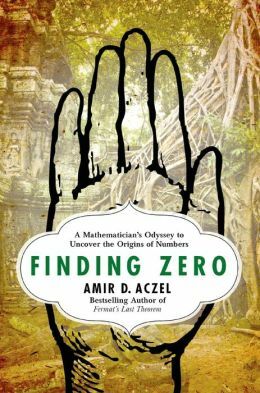 The dustcover of Finding Zero: A Mathematician’s Odyssey to Uncover the Origins of Numbers by Amir D. Aczel is reminiscent of Buddhist philosophy publications. The drawing of a right palm immediately made me think of a classic Mudra or gesture of the Lord Buddha. The juxtaposition of the illustration with the book title intrigued me enough to check out the book. I began my first encounter with Aczel’s writing talents by reading the acknowledgments. I recognized a few of the names, especially the Alfred P. Sloan Foundation. The presence of the Cambodian Ministry of Culture and Fine Arts made me want to read more. I knew then, that Finding Zero was not going to be a dull history of mathematics. The odyssey begins with Aczel’s unusually fortunate childhood. His father captained a cruise ship that sailed the Mediterranian Sea. The family frequently was aboard to enjoy and learn about the many ports of call. Because Aczel only attended formal school part time, he and his sister were taught by tutors and self-study. Aczel was greatly influenced in his love of mathematics by his father’s Hungarian steward, Laci. It was during Aczel’s childhood that his drive to discover the origins of our numbers and, especially, zero emerged. Laci, himself, had an interesting personal history. He had been a star mathematics student at Moscow University. He was involved in some sort of scandal and was asked to quit school by the KGB. Laci then moved to Czechoslovakia to learn how to fly military aircraft. Laci then took his revenge upon the USSR by stealing one of its fighter jets. He flew the plane to Israel and presented it to the Israeli Air Force as a gift. Afterwards, Laci had nothing to do, so he began working for the shipping company Zim Lines. It was there, that Laci became acquainted with Aczel’s father. With his childhood background out of the way, Aczel takes the reader along on his adventure through history and travel in his quest to find civilization’s oldest physical artifact of zero. The Buddhist connection is alluded to at first, then becomes more important as the story unfolds. Aczel is convinced that the Buddhist concept, Shunyata, as taught by the iconic teacher, Nagarjuna, played an important part in the development of the modern concept of zero. Shunyata is the arcane concept of emptiness or the void. Because I’m a long-time student of Buddhism, the Nagarjuna connection, and Aczel’s interpretation of Shunyata drew me closer to the book. The quest to rediscover the long-lost artifact K-127 takes the reader from California, to the Mediterranean, to South Asia, and the Far East. The odyssey is attention grabbing, exciting, and intellectually stimulating. Finding Zero is much more fascinating than I expected. Anybody who is interested in archaeology, Eastern Philosophy, history, travel, and mathematics will love the stories in this book. I later found out that Amir D. Aczel has written several other books that I now want to read. His international bestseller is Fermat’s Last Theorem. Aczel’s other books include, Mystery of the Aleph, and The Riddle of the Compass. 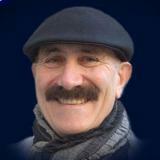 He is a Massachusetts resident and is a fellow of the John Simon Guggenheim Memorial Foundation. An eclectic guy who likes to observe the world around him and comment about those observations. This entry was posted in Books, cultural highlights, History, Politics, religion and tagged Amir D Aczel, Buddhism, mathematics, Nagarjuna, numbers, Shunyata, zero. Bookmark the permalink. Great article. i’m getting this book, thanks for the tip. I enjoyed this book too… if you like science you should also read Aczel’s 2010 book “Present at the Creation: The Story of CERN and the Large Hadron Collider” (the “LHC” team at CERN announced they found the elusive Higgs Boson in 2012). This looks like another book I’d like, too. Thanks. I have, I did enjoy it.